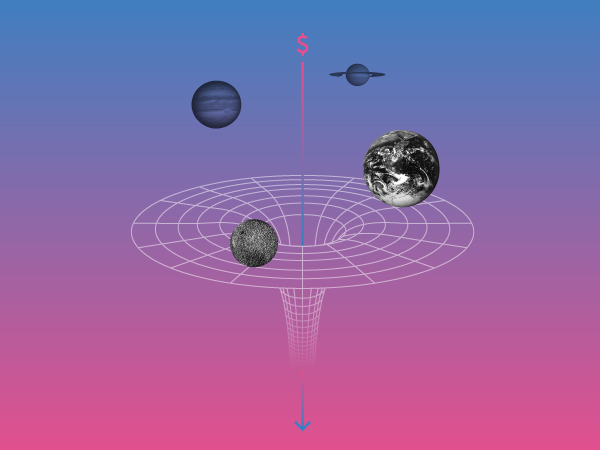 As humanity pushes outward into space, how will the galaxy’s wealth be shared? The privatization of the Milky Way has begun. Last summer, the bipartisan ASTEROIDS Act was introduced in Congress. The legislation’s aim is to grant US corporations property rights over any natural resources — like the platinum-group metals used in electronics — that they extract from asteroids. The bill took advantage of an ambiguity in the United Nations’ 1967 Outer Space Treaty. That agreement forbade nations and private organizations from claiming territory on celestial bodies, but was unclear about whether the exploitation of their natural resources would be allowed, and if so, on what terms. The legal framework governing the economic development of outer space will have enormous effects on the distribution of wealth and income in the Milky Way and beyond. We could fight for a galactic democracy, where the proceeds of the space economy are distributed widely. Or we could accept the trickle-down astronomics anticipated by the ASTEROIDS Act, which would allow for the concentration of vast amounts of economic and political power in the hands of a few corporations and the most technologically developed nations. Given the pressing problems of inequality and climate change on Earth, the US left has been understandably uninterested in or largely dismissive of any space pursuits. For this reason, it remains unprepared to organize around extraterrestrial economic justice. The Left’s rejection of space has effectively ceded the celestial commons to the business interests who would literally universalize laissez-faire. Organizing around extraterrestrial politics wasn’t always treated as an escapist distraction. In the 1970s, fighting for a celestial commons was a pillar of developing countries’ struggle to create a more equitable economic order. Starting in the 1960s, a coalition of underdeveloped nations, many recently decolonized, asserted their strength in numbers in the United Nations by forming a caucus known as the Group of 77. In the early 1970s, this bloc announced its intention to establish a “new international economic order,” which found its expression in a series of UN treaties governing international regions, like sea beds and outer space, that they hoped would spread the economic benefits of the commons more equitably, with special attention to less developed nations. For these countries — as well as for the nervous US business interests that opposed them — their plan to “socialize the moon,” as some put it at the time, was the first step toward a more egalitarian distribution of wealth and power in human society. It will be years before the industrialization of outer space is economically viable, if it ever is. But the legal framework that would shape that transition is being worked out now. The ASTEROIDS Act was submitted on behalf of those who would benefit most from a laissez-faire extraterrestrial system. If we leave the discussion about celestial property rights to the business interests that monopolize it now, any dream of economic democracy in outer space will go the way of jetpacks, flying cars, and the fifteen-hour workweek. Left critics of space proposals make the same mistakes as the most techno-utopian starry-eyed industrialists. From the point of view of the latter, celestial development will provide ultimate salvation to the human race by making us a multi-planetary species; the former see outer space as an infinite void essentially antagonistic to human life, interest in which is only orchestrated for cynical political ends. Each side misconceives extraterrestrial pursuits as qualitatively different from economic activities on Earth. Venturing into space may be a greater technical challenge; it may cost more, be more dangerous, or be a mistaken use of resources. But to understand these prospects in existential terms rather than as a new episode in the familiar history of industrial development and resource extraction — with all the political-strategic dangers and organizing opportunities that come with them — is to be blinded by the space romanticism that is a peculiar vestige of Cold War geopolitics. Whether and how we should go to space are not profound philosophical questions, at least not primarily. What’s at stake is not just the “stature of man,” as Hannah Arendt put it, but a political-economic struggle over the future of the celestial commons, which could result in a dramatic intensification of inequality — or a small step for humankind toward a more egalitarian state of affairs on our current planet. Undoubtedly, there are good reasons to be skeptical about going to space. Some have argued that it shifts attention away from solving the difficult problems of economic and environmental justice on Earth — think of Gil Scott-Heron’s spoken-word poem “Whitey on the Moon,” which juxtaposes the deprivation of the American underclass with the vast resources diverted to space. Scott-Heron’s critique is powerful, but it’s important to remember that he was denouncing an unjust economic system. He wasn’t issuing a timeless condemnation of space pursuits as such. Whether the aims of providing for all and developing outer space are mutually exclusive depends on the political forces on the ground. We might also question whether mining asteroids would be detrimental to our current planet’s environment in the medium term. If we don’t find a renewable way to blast off into outer space, the exploitation of these resources could lead to an intensification of, not a move away from, the fossil-fuel economy. If the environmental impact of space mining turns out to be large, it would be analogous to fracking — a technological development that gives us access to new resources, but with devastating ecological side effects — and ought to be opposed on similar grounds. On the other hand, some speculate that mining the Moon’s Helium-3 reserves, for example, could provide an abundant source of clean energy. The terrestrial environmental impact of space activity remains an open question that must be explored before we stake our hopes on the economic development of outer space. Philosophers have suggested that we might have ethical duties to preserve the “natural” states of celestial bodies. Others fear that our activities might unknowingly wipe out alien microbial life. We should remain sensitive to the aesthetic and cultural value of outer space, as well as the potential for extinction and the exhaustion of resources misleadingly proclaimed to be limitless. But if the Left rejects space on these grounds we abandon its fate to the will of private interests. These concerns shouldn’t cause us to write off space altogether — rather, they should motivate us even more to fight for the careful, democratic use of celestial resources for the benefit of all. There is also reason to be cautiously optimistic about extending economic activity to outer space. For one, the resources there — whether platinum-group metals useful in electronics, or fuels that could be central to the semi-independent functioning of an outer space economy — have the potential to raise our standards of living. Imagine, a superabundance of asteroid metals that are scarce on Earth, like platinum, driving the sort of automation that could expand output and reduce the need to work. Of course, there’s nothing inevitable about the benefits of productivity gains being distributed widely, as we’ve seen in the United States over the past forty years. This is a problem not limited to space, and the myth of the “final frontier” must not distract us from the already existing problems of wealth and income distribution on Earth. While the industrialization of the solar system isn’t a panacea for all economic ills, it does offer a significant organizing opportunity, since it will force a confrontation over the future of the vast celestial commons. The democratic possibilities of such a struggle have been recognized before: one conservative American citizens’ group in the 1970s called a progressive UN space treaty a “vital component of Third World demands for massive redistribution of wealth so as ultimately to equate the economic positions of the two hemispheres.” Many in the 1970s identified the egalitarian potential in the development of outer space, and the Left must not overlook it today. One of the Group of 77’s major goals was to apply some of the redistributive functions of the welfare state on a global scale. In 1974, that coalition issued a “Declaration on the Establishment of a New International Economic Order,” which called for a fairer system of global trade and resource distribution, one that could alleviate historical inequality. One of the battlegrounds for the Group of 77 was the negotiation over extraterrestrial property rights. The Outer Space Treaty of 1967, signed by over ninety countries in the heat of the first sprint to the moon, rejected the notion that celestial bodies fell under the legal principle of res nullius — meaning that outer space was empty territory that could be claimed for a nation through occupation. It forbade the “national appropriation by claim of sovereignty, by means of use or occupation, or by any other means” of outer space. But the treaty was not just restrictive. It also had a positive requirement for extraterrestrial conduct: “The exploration and use of outer space,” it declared, “shall be carried out for the benefit and in the interests of all countries, irrespective of their degree of economic or scientific development, and shall be the province of all mankind.” However, nobody knew what this would mean in practice: was it a call for egalitarian economics, or an empty proclamation of liberal benevolence? Complicating matters, it was unclear whether the extraction and sale of natural resources from outer space fell under the category of “appropriation,” which had been forbidden. And what exactly was this benefit to all countries that our outer space pursuits were supposed to bring? How would its distribution be enforced? Which interpretation would win out was more a question of political power than of esoteric legal maneuvers. The Group of 77 took an activist approach to these issues, proposing amendments to the Outer Space Treaty regime that would spread the economic benefits of the celestial commons to less developed countries that did not have the resources to get to space, let alone mine it. Thus in 1970, the Argentine delegate to the UN Committee on the Peaceful Uses of Outer Space proposed to legally designate outer space and its resources “the common heritage of mankind.” First applied in negotiations over maritime law a few years earlier, the “common heritage” concept was intended to give legal grounding to the peaceful international governance of the commons. As an alternative to the laissez-faire approach advocated by many private interests, the “common heritage” principle also provided a legal framework for the democratic distribution of revenues derived from the international commons. In 1973, the Indian delegation to the Committee on the Peaceful Uses of Outer Space tried to put this idea into celestial practice, proposing an amendment to the Outer Space Treaty that called for equitable sharing of space benefits, particularly with developing countries. The Brazilian delegate to the committee summarized the group’s position: “It does not seem justifiable . . . that space activities . . . should evolve in a climate of total laissez-faire, which would conceal under the cloak of rationality new ways for an abusive exercise of power by those who exert control over technology.” Despite opposition from both the Soviet Union and the United States, the final draft of this new outer space agreement included a version of the “common heritage of mankind” doctrine. When the finalized treaty was brought to the US in 1979 for ratification, business groups balked. The vision of egalitarian galactic democracy suggested by the document was rightly seen as contrary to narrow American interests. The president of the corporation, Alexander Haig, also testified against the treaty in Congress in 1979, warning that “the common heritage concept expressed in the treaty underlies Third World efforts directed at a fundamental redistribution of global wealth.” Haig was hired as Ronald Reagan’s secretary of state in 1981, and political opposition to the bill forced NASA’s chief counsel to abandon defense of the treaty. The conversation had shifted from the distribution of economic benefits to a narrower emphasis on international scientific coordination and development aid. This retreat culminated in a 1996 declaration that limited the interpretation of the “benefit” clause of the Outer Space Treaty to vague promises to help less developed countries improve their space technologies. The ultimate failure of the Moon Treaty was representative of broader developments in international politics, as the influence of the Group of 77 declined. The fact that the structural adjustment policies of the Washington Consensus won out over the Third World’s redistributive goals was the result of contingent factors — the oil shock’s exacerbation of debt crises, for instance — but it also indicated the limits of the power the Group of 77 had wielded in the first place. In October 2014, the UN outer space committee issued a press release summarizing its most recent session. Its headline: “Outer Space Benefits Must Not Be Allowed to Widen Global Gap between Economic, Social Inequality, Fourth Committee Told.” Despite paying lip service to its past concerns, the outer space committee now emphasizes equal access, voluntary technology transfers, and modest development aid over the direct redistributive approach it took in the 1970s. This shift from struggling for equality of outcome to equality of opportunity, with no accountability mechanism in place to ensure even the latter, represents a striking regression. The egalitarian dreams of the “revolution of the colonized” in the UN, as it was called at the time, have been forgotten. Recent US plans for outer space development, shaped overwhelmingly by Silicon Valley’s intuitions and capital, stand in stark contrast to the futuristic democratic dreams of the Group of 77. The most prominent of these entrepreneurial visions has been Elon Musk’s plan to colonize Mars. For now, international law seems to unequivocally forbid territorial claims on Mars and other celestial bodies. The legal status of resource extraction, on the other hand, remains an open question. A vocal group of entrepreneurs is hoping to set a precedent for the private appropriation of natural resources from asteroids, without internationally redistributive obligations. Planetary Resources, an asteroid-mining company whose backers include Larry Page, Eric Schmidt, and James Cameron, plans to launch satellites to prospect for valuable asteroids in the next two years. Another US firm, Deep Space Industries, will launch exploratory satellites as soon as next year. These entrepreneurs hope to extract the valuable platinum-group metals, essential for manufacturing electronics, that are rare on Earth. Sensationalist articles on space mining will tell you about an asteroid worth $20 trillion. Investors also believe that asteroids might provide water that could be broken down into oxygen and hydrogen in space, yielding air for astronauts and fuel for their ships. This could facilitate a dramatic acceleration in the economic development of outer space. The legislation was intended to clarify US interpretations of international space law, explicitly granting American companies the right to extract asteroid resources and bring them to market. The conclusion of Congress’s last session means that the bill will have to be reintroduced for it to move forward, and it is uncertain exactly when and how this will happen. But its appearance marked another clear attempt to unilaterally push international norms toward the free extraction of outer space resources, with limited democratic responsibilities attached — and it will not be the last. Joanne Gabrynowicz, editor emerita of the Journal of Space Law , said that an adviser to Planetary Resources had drafted the bill. Deep Space Industries also sent a letter supporting it directly to the space subcommittee of the House of Representatives. Moreover, Congressman Bill Posey, a cosponsor of the act, represents Florida, a state that Gabrynowicz pointed out has recently been forced to try to attract commercial space business — a direct response to the economic hardship caused by the decommissioning NASA’s space shuttle program. Such extraterrestrial special interests will no doubt continue to exert legislative pressure. There is strong legal precedent and consensus of “finders, keepers” for resources that are liberated through private investment, and the same will be true on the moon. You don’t have to own land to have ownership of resources you unlock from it. Moon Express will use existing precedents of peaceful presence and exploration set by the US government forty years ago. This redeployment of the finders-keepers principle is anathema to the redistributive regime imagined by the Group of 77. Private companies like Planetary Resources and Moon Express, with support from the federal government, are betting not only on the viability of space industrialization, but also on their ability to push through a legal regime that will validate their property claims on their terms. But the universalization of laissez-faire is not inevitable. The history of the Moon Treaty serves as a reminder that outer space is not just a screen onto which we project techno-utopian fantasies or existential anxieties about the infinite void. It has been, and will continue to be, a site of concrete struggle over economic power. The politics of the present are undoubtedly different from those of the 1970s. The egalitarian project of the Group of 77 has given way to BRICS-style market liberalism. Global capital has gained power where international labor efforts have stagnated. Domestic inequalities have skyrocketed. The rapid proliferation of information technologies has temporarily masked the reality that the future, to paraphrase William Gibson, is not being very evenly distributed. Without international political organization to challenge galactic market fundamentalism, a twenty-first century space odyssey could mean the concentration of even more wealth and income in the hands of a few powerful corporations and the most technologically advanced countries. At the same time, and for the same reasons, the prospect of preserving the final frontier as a celestial commons presents an opportunity to fight for a more democratic political economy. Sharing the benefits of the celestial commons is key to expanding democracy to a galactic scale. One time-tested means of distributing the benefits of natural-resource extraction universally is the sovereign wealth fund, which Alaska uses to deliver oil revenue to its residents. As an international commons, outer space offers an opportunity to experiment with such redistributive mechanisms beyond the traditional confines of the nation-state. Organizing around an issue of such scale may seem utopian, but it’s also necessary. From regulating capital to mitigating climate change, the problems that confront us are inherently global in scope and require commensurate strategies. At the very least, the global left ought to demand the creation of an independent Galactic Wealth Fund to manage the proceeds of outer space resources on behalf of all human beings. At first, it would amount to little, divided up among all of us. But as the space economy grows relative to the terrestrial one, social dividends from the Galactic Wealth Fund could provide the basis for a truly universal basic income. This is just one component of a broader platform for galactic democracy that must be developed collectively. Extraterrestrial economic justice — not just shiny technological advances — will be central to any truly egalitarian politics in the twenty-first century. It’s time to start building a democratic futurism. Nick Levine is an MPhil candidate in history of science at the University of Cambridge.